Naruto: Flying Legends is an Naruto text-based role playing forum that takes place in the far future of the Naruto world. Characters in the manga did exist in the past of our world, but cannot be communicated, or revived in any way during game play as of now (nor can they be recreated as your own character). It was started by Hateshinai, but most call him Shinai for short. He has had experience with modding before and decided to be the admin of his own site, dedicated to his members and role play. Our graphics are also done by him, as well. Once upon a time, there was a young boy. He would grow to change the world of the shinobi as we knew it. He would be the first man since the Sage of Six Paths to learn the names of each and every Bijuu and fully master the power of the Nine Tailed Fox. He'd End the Fourth Shinobi War by means that seemed impossible. The name of this boy was Naruto Uzumaki, son of the Fourth Hokage. This story woul d be told down through the ages in shinobi academies and read to children by their parents like fairy tales. Surprisingly, this war led to a time of peace, that lasted for one hundred years. It was a time of union between nations, civility in the world. But then a Fifth Shinobi World War broke out with the announcement of the new Mizukage. He partnered with the land of rice fields (Otagakure) to destroy the other nations. One by one they took down other small shinobi nations, gaining many allies along the way, an army strong enough to make a wasteland of Sunagakure. The desert was the only place untouched, although fiery pieces of the remains of Suna laid waste by the demolished gates, almost ironically peaceful. The Mizukage was taken down in the attack by the Kazekage, however, in the fight which ended the war. The entire army was eliminated by the Leaf Elite Anbu force almost too easily, and were put in prisons around the world. A statue for the honored Kazekage was placed in the center of the desert, as a memorial of his bravery and sacrifice. Now, thirty more years ahead, much had changed. New shinobi were rising up again and a new generation was ready to take over. Kages had changed again and villages began to flourish once more. Otagakure had become something of a wasteland. Few people if any lived there, some still trying to rebuild their old homes. 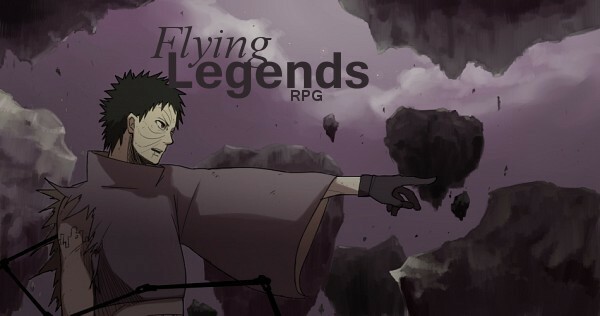 Flying Legends is a fun Naruto Role Playing site where people can have fun, not having to write tons of words and exhaust themselves to get what they're working for. We have a experience system so whenever someone posts, they gain some experience which can later be used to buy techniques and other extras. Our ranking system is simple and we have Chuunin Exams every 4 months. So in a short amount of time you can easily reach a high rank. Or you could just enjoy the rank you have. We are currently looking for several moderator spots to fill, as well, being a considerably new forum. For further information and contact details, click here.